During the summer I was asked to take part in a photoshoot being staged by Little White Books. I was thrilled to involved meeting lots more fabulous wedding professionals - hair, make up, bridal, photography and venue dressers. 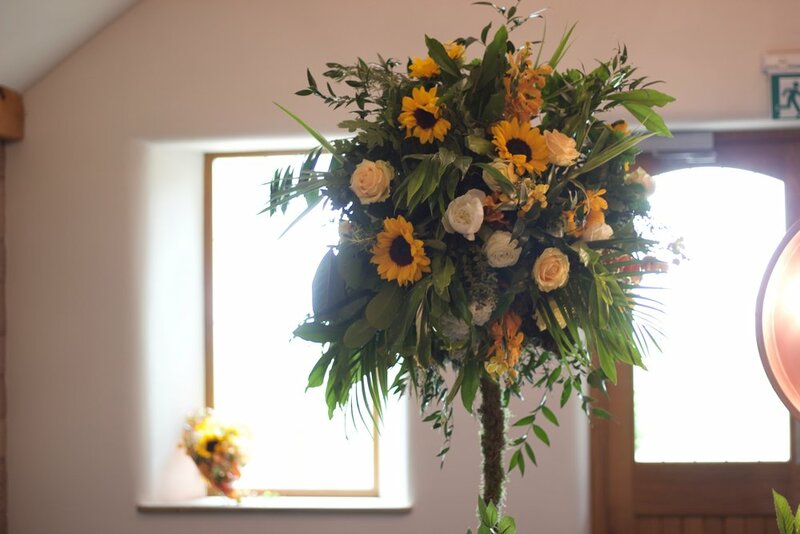 I was told that one of the dresses to be modelled had a hint of sunflowers in the underskirt so I was asked to bring along a bouquet including sunflowers. On closer inspection the dress also included orchids. Always loving being able to play and be creative I designed a bouquet with both flowers included. I created one very natural bouquet with plenty of foliage - bang on trend at the moment. The other I created a framework out of wool and ribbon and made a slightly different bridal bouquet. I threw (not literally!!) a few extra flowers in the van because I had no idea what to expect. On arrival the lovely Beks from Little White Books asked if I could decorate some large LOVE letters. Again, I thought I'd try something a little bit different and I didn't have many flowers to play with. Absolutely thrilled with the finished effect.